Terry Apala has released a follow up video to “Mushin” —a cover to Ramz’s “Barking”— which was issued earlier this month. The song tributes Mushin, the street Terry Apala grew up in and the video finds a similar directive, set on the streets of Mushin, where friends from the streets show their support through their cameos. Like himself and his style, the video infuses the odd blend of his rough zonked out vocals and his urban lyrics. It is indigenously created with a clean, yet low-budget imagery of pot-hole ridden streets and wooden pillars of a street shop used as a makeshift stripper pole. The bromance between 50 Cent and 6ix9ine, and 50’s declaration of the 22-year old rapper as the “King of New York”, has long-envisaged a possible collaboration which we finally have thanks to Uncle Murda’s “Get The Strap”. The two rappers join Uncle Murda and Casanova for a gangster-core rap number where they ridicule their competition. The Eif Rivera-directed video opens with masked men robbing and shooting up a building before driving off, gun blazing. While Tekashi 6ix9ine rides out the window of a cop car, 50 Cent stands by the dork, delivering violent rap bars with a night view of the city as the backdrop. The video premiered during Episode 8 of “Power”. Being fierce has never looked sexier than in 2018, with role models like Cardi B, turning unfiltered charisma into charm. For her latest single, “Pull Up”, Beverly Oh performs an empowering set, basking in her glow. Over the catchy instrumentals produced by Insane Chips, she takes a dark intense direction to fend off competition. As she sings, “Warning, I’m Coming/ Toxic, I’m Burning”, Paul Gambit directs the music video portraying Beverly Oh as a superstar who walks around with an entourage of dancers and rides around the city in a Benz. Off her recently released Invasion of Privacy album debut, Cardi B just released the video for the 8th track, “Ring”, featuring Kehlani. Produced by Scribz, Needlz and Donut, “Ring” is one of the more somber cuts from the album. On it, the rapper and the singer lament the lack of communication in their relationships. The surreal video for “Ring” is directed by Mike Ho, who shows both artists in symbolic shots such as a floating phone booth and Cardi in tangled black ropes. The unmistakable melancholy in the song reflects in the tortured direction of the video. Joey B’s latest single, “Stables” is instantly recognizable as Country music through the bounce of the guitar-led-instrumental produced by NOVA. However, the other elements of the production lean closer to Pop music through the fusion of synths and verses from Joey B and La Même Gang (Darkovibes, Kiddblack, $pacely, KwakuBS, and RJZ). 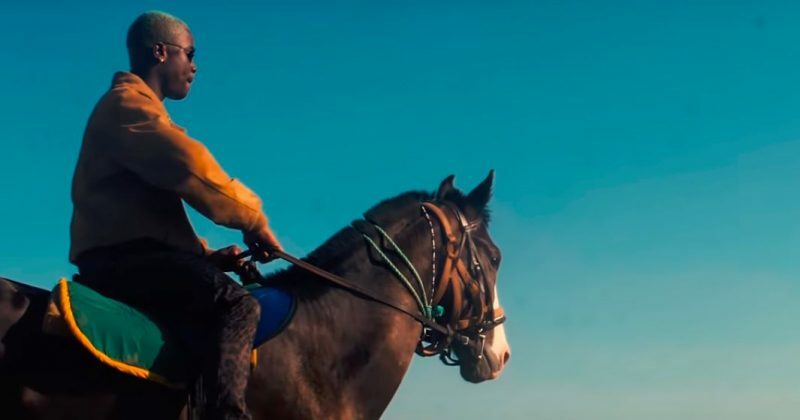 The music video, directed by David Duncan, also infuses Country-esque elements through an open field setting where all artists tan in the sun and ride around on horses and bikes. After the success of 2015’s “Goosebumps” —which marked the fourth Sony film to reign at the top of the box office during the fall— Sony is returning with a sequel to the live action family film called “Goosebumps 2: Haunted Halloween”. Although cuts from the trailer reveal that the story continues from where the first part stopped with R. L. Stine’s book making an appearance, the cast for “Haunted Halloween” is primarily new. Some of the other changes made to the film’s franchise also include Rob Lieber penning the script and Ari Sandel taking over in the director’s chair. From the teaser trailer, we see two kids stumble on Stine’s old house, finding a locked book that unleashes an animate dummy that naturally embarks on an evil mission to bring more creatures to life on Halloween. The film is expected to start showing in cinemas this October.